iOS applications are always well designed and rich in features, but they come along with a lot of complexity. At present, Apple is the most widely used brand compared to other brands currently present in this market. iOS platforms provide you with great gaming apps, quiz apps as well as music apps. But this application needs proper codes, designing, as well as testing to be developed. Any tech-savvy person can quickly develop an iOS app. If you are facing any obstacle for updating an app, you may connect to our team at Tech Support Dubai for iOS app development services. 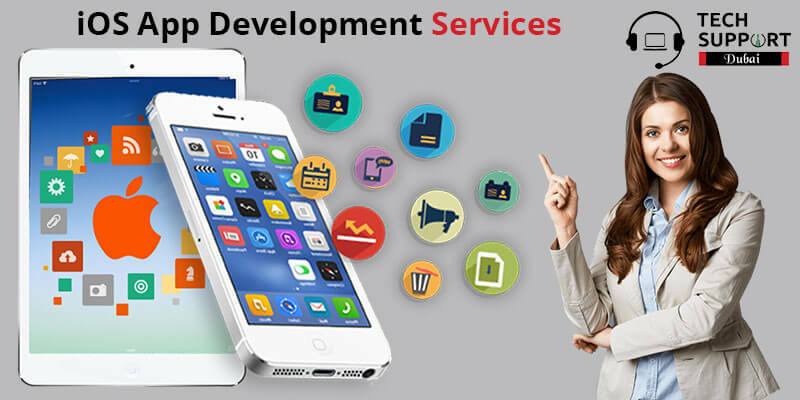 We have skilled developers who will develop you a unique iOS app at a pocket-friendly rate. There are many reasons for you to develop an app on the iOS platform. Here is a list of reasons why iOS is outrunning Android nowadays. Quality: When it comes to quantity, many others platforms can beat iOS. But when it comes to quality, no platform can beat the iOS, as iOS gives the best quality applications for children, games, and media. Siri: Siri is an AI assistant that answers to your all questions seamlessly. With a well developed Siri, you can get perfect answers to all your questions without any errors. Ease of use: iOS apps are always easy to use. It gives satisfaction as well as many ways to earn profits and revenues. Earn Profits: If you can develop a great app that is addictive as well as useful, you will earn a great revenue through ads and popups. You can even get more requests to build similar kinds of applications. Our well-trained experts at Tech Support Dubai follow a unique method to develop apps on iOS platforms. Here is a list of reasons why you should choose our team at Tech Support Dubai to create iOS apps. Skilled iOS Developers: Our developers have years of experience and specialize in developing apps on iOS platform. Code In-House: All our codes are generated and completed at our TechSupportDubai office. We do not outsource any codes. End-To-End Service: Our app development on iOS platforms includes consulting, unique strategies, testing as well as delivery. Custom Agile process: Our iOS apps undergo a custom agile process which reduces risks and increases the velocity as well as transparency. Our experts at Tech Support Dubai will assist you in the best manner to develop an iOS app. We offer high-quality services at an affordable price. Get in touch with us and allow our experts to develop unique iOS apps for you. You can directly call on the customer care number of Tech Support Dubai 042053349 . Our experts at are available round the clock to assist you with iOS app development. Tech Support Dubai can even chat with our experts on our live chat portals. You can also directly send your service request on our official email id. Our developers will get in touch with you soon. We also provide SSD data recovery services in Dubai.